Not to be confused with Jersey Legal French. Jèrriais is the form of the Norman language spoken in Jersey, one of the Channel Islands off the coast of France. It has been in decline over the past century as English has increasingly become the language of education, commerce and administration. There are very few people who speak Jèrriais as a mother tongue and, owing to the age of the remaining speakers, their numbers decrease annually. Despite this, efforts are being made to keep the language alive. A similar language, Guernésiais, is spoken in neighbouring Guernsey; the language of Sark, Sercquiais, is a descendant of the Jèrriais brought by the Jersey colonists who settled Sark in the 16th century; and there is mutual intelligibility with the Norman language of mainland Normandy. 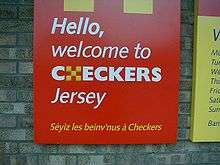 Jèrriais is often called "Jersey French" or "Jersey Norman French" in English (though this may give the impression that the language is a dialect of French) and "jersiais" or "normand de Jersey" in French. Jèrriais is distinct from the Jersey Legal French used for legal contracts, laws and official documents by the government and administration of Jersey. For this reason, some prefer using the term "Jersey Norman" to avoid ambiguity and to dissociate the language from standard French. 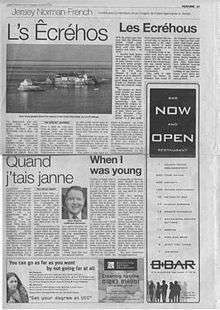 Local newspaper Jersey Evening Post hosts a Jersey Norman-French feature, with Jèrriais texts accompanied by their translation into English. The latest figures come from the Jersey Annual Social Survey issued on 5 December 2012. The survey of 4200 households took place in June 2012 and resulted in 2400 returns. It showed that 18% of the population could speak some Jèrriais words and phrases with more than 7% of those over 65 being fluent or able to speak a lot of Jèrriais. Two-thirds of adults said that they could not understand spoken Jèrriais, but more than a quarter are able to understand some, and 5% more can usually or fully understand someone speaking Jèrriais. 4% of people said that they could write some Jèrriais, although under 1% could write fluently. Just under a third (32%) said that they could understand something written in Jèrriais. These figures update those of the census (2001) which showed that approximately 3% of the island's population speak Jèrriais in their personal interactions, although research suggests that up to 15% of the population have some understanding of the language. The latest census figures also showed an increase in declarations of children speaking the language: the first such increase recorded in census figures (although this may be due to greater consciousness among parents than to language use), doubtless encouraged by the introduction of a Jèrriais teaching programme into Jersey schools. The parish with the highest proportion (8%) of Jèrriais speakers is Saint Ouen, and that with the lowest proportion (2.1%) is Saint Helier, although Saint Helier as the largest parish has the highest number of Jèrriais speakers. The number of census respondents who stated that they "usually" spoke Jèrriais was 113; 2,761 respondents stated that they "sometimes" spoke Jèrriais. A survey carried out among a sample of Jèrriais speakers in 1996 found that 18% spoke Jèrriais more often than English, 66% spoke Jèrriais as often as English, and 16% spoke Jèrriais less often than English. Jersey almost lost its language in the 20th century. By 2001 there were less than 3,000 speakers of Jèrriais. In the 21st century strenuous efforts are being made to re-establish it. Le Don Balleine, funded by the States, is leading a programme in schools teaching Jèrriais. L'Assembliée d'Jèrriais promotes the language generally. Language brings distinctiveness, a sense of localness and a whole new set of skills all of which are important qualities in attracting the creative economy. It is fundamental to the Island's identity. This objective is to work with these organisations to help in the revival and status of the language. In September 2009 a partnership agreement was signed by the Minister for Education, Sport and Culture and the President of Le Don Balleine to formalise the rôle of L'Office du Jèrriais in protecting and promoting Jèrriais and to develop a language plan to help make the language more prominent on a daily basis. There is newspaper and radio output in the language. From 2010, Jersey banknotes carry the value of the note written out in Jèrriais. Jèrriais is recognised as a regional language by the British and Irish governments within the framework of the British-Irish Council. The literary tradition is traced back to Wace, the 12th-century Jersey-born poet, although there is little surviving literature in Jèrriais dating to before the introduction of the first printing press in Jersey in the 1780s. The first printed Jèrriais appears in the first newspapers at the end of the 18th century, and the earliest identified dated example of printed poetry is a fragment by Matchi L'Gé (Matthew Le Geyt 1777 – 1849) dated 1795. A boom in competing newspapers and journals throughout the 19th century provided a platform for poets and writers to publish regularly – typically, satirical comment on the week's news, elections, Jersey politicians and notables. The first printed anthology of Jèrriais poetry, Rimes Jersiaises, was published in 1865. Influential writers include "Laelius" (Sir Robert Pipon Marett 1820 – 1884, Bailiff of Jersey 1880 – 1884), "A.A.L.G." (Augustus Aspley Le Gros 1840 – 1877), "St.-Luorenchais" (Philippe Langlois 1817 – 1884). Elie (Edwin J. Luce 1881 – 1918) was editor of the French-language newspaper La Nouvelle Chronique de Jersey, and a poet who wrote topical poems for the newspaper. He was also active in promoting the development of drama in Jèrriais and organised performances, ultimately leading to the establishment of a Jèrriais section of the Jersey Eisteddfod in 1912. During the Occupation, Nazi censors permitted little original writing to be published. However, many older pieces of literature were re-published in the newspapers as an act of cultural self-assertion and morale-boosting. After the Occupation and with the re-establishment of a free press, Edward Le Brocq (1877 – 1964) revived a weekly column in 1946 with a letter from Ph'lip et Merrienne, supposedly a traditional old couple who would comment on the latest news or recall time past. 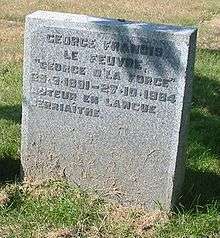 The most influential writer of Jèrriais in the 20th century was a U.S. citizen, George Francis Le Feuvre (1891 – 1984) whose pen-name was "George d'la Forge". He emigrated to North America after the First World War but for almost forty years maintained a flow of articles in Jèrriais back to Jersey for publication in newspapers. Selections of his articles have been published in book form. Frank Le Maistre (1910–2002), compiler of the dictionary Dictionnaire Jersiais–Français, maintained a literary output starting in the 1930s with newspaper articles under the pseudonym Marie la Pie, poems, magazine articles, research into toponymy and etymology. Since Le Maistre, Geraint Jennings has been influential in preserving the language by compiling thousands of pages of Jèrriais text online in Les Pages Jèrriaises, including parts of the Bible. Although Jèrriais is now the first language of a very small minority, until the 19th century it was the everyday language of the majority of the population, and even until the Second World War up to half the population could communicate in the language. However, there is no complete Bible in Jèrriais (although there are versions of favourite Bible texts in Jèrriais), as French was, until the 20th century, the predominant language of the Church in Jersey (although sermons would be preached, or explained, in Jèrriais in country areas). Awareness of the decline of language use became apparent in the 19th century in scholarly circles. Among foreign linguists, Louis Lucien Bonaparte visited Jersey and interested himself in the language and its literature. Victor Hugo, during his exile in Jersey, took an interest in the language and numbered some Jèrriais writers among his circle of acquaintances and supporters. Sir Robert Pipon Marett's prestige and influence helped to reinforce the movement toward standardisation of the writing system based on French orthography, a trend which was also helped by the nascent Norman literary revival in the neighbouring Cotentin area of mainland Normandy where writers, inspired by the example of the Norman writers of Jersey and Guernsey, began their own production of literary works. 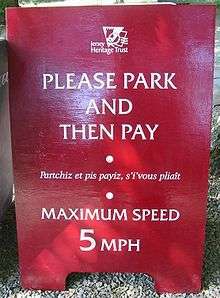 However, differing (if mutually comprehensible) writing systems have been adopted in Jersey, Guernsey and mainland Normandy. The question is sometimes raised as to whether Jèrriais should move to a writing system based on English orthography, however this would have implications for the continuity of the literary tradition over two centuries or more (note though, that the digraph "th" for the typical dental fricative of Jèrriais has evidently been borrowed from English orthography). As English became dominant in Jersey in the 20th century, efforts were made to preserve the Jèrriais language. 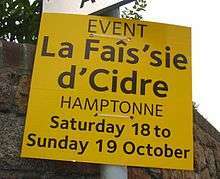 The Jersey Eisteddfod has included a Jèrriais section since 1912. Associations were founded. L'Assembliée d'Jèrriais was founded in 1951, while Le Don Balleine is a trust set up in accordance with the will of Arthur E. Balleine (1864–1943), who bequeathed funds for the promotion of the language. L'Assembliée d'Jèrriais launched a quarterly magazine in 1952, which has been published since (with the occasional hiatus, and latterly under the editorship of Le Don Balleine); a standard grammar Lé Jèrriais pour tous (by Paul Birt) appeared in 1985; cassettes, booklets and other materials have also been produced. George d'la Forge's maintenance of the language in the North American diaspora is not as surprising as it might seem, as considerable numbers of Jersey people had been involved in the economic development and exploitation of the New World (see New Jersey). Much of the concentration focused on the cod fisheries of the Gaspé peninsula in Quebec, Canada, which were controlled into the early 20th century by Jersey-based companies or companies of Jersey origin employing Jersey labour. The common language of business was Jèrriais, and it is reported that there were still some Jèrriais-speakers in Gaspé villages in the 1960s. The Gaspesian expression "faire une runne" (to go and work outside the region) comes from the Jèrriais word "run" applied to a fishing station. 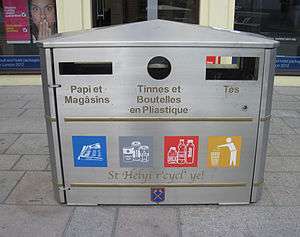 An inscription, reading "Liberated" in Jèrriais, was installed at La Pièche dé l'Av'nîn in St. Helier in 2005 to mark the 60th anniversary of the Liberation. The use of Jèrriais is also to be noted during the German Occupation of the Channel Islands during the Second World War; the local population used Jèrriais among themselves as a language neither the occupying Germans, nor their French interpreters, could understand. However, the social and economic upheaval of the War meant that use of English increased dramatically after the Liberation. It is considered that the last monolingual adult speakers probably died in the 1950s , although monolingual speaking children were being received into schools in St. Ouen as late as the late 1970s. Famous Jèrriais speakers include Lillie Langtry and Sir John Everett Millais, the Pre-Raphaelite painter. The history of Jèrriais dictionaries goes back to 19th-century manuscript glossaries work of Philippe Langlois, A. A. Le Gros and Thomas Gaudin. These were later revised and expanded into the Glossaire du Patois Jersiais published in 1924 by La Société Jersiaise. The 1960 Glossary of Jersey French (Nichol Spence) recorded Jèrriais in phonetic script. The 1924 Glossaire inspired the research by Frank Le Maistre that culminated in the Dictionnaire Jersiais–Français published in 1966 to mark the 900th anniversary of the Norman Conquest of England. The first practical English–Jèrriais dictionary was the English-Jersey Language Vocabulary (Albert Carré in collaboration with Frank Le Maistre and Philip de Veulle, 1972) which was itself based on the Dictionnaire Jersiais–Français. A children's picture dictionary Les Preunmié Mille Mots was published by La Société Jersiaise in 2000. In 2005 a Jèrriais–English dictionary Dictionnaithe Jèrriais-Angliais was published by La Société Jersiaise, in collaboration with Le Don Balleine. A revised, modernised and expanded English–Jèrriais dictionary Dictionnaithe Angliais-Jèrriais, was published in 2008 by Le Don Balleine. Jèrriais has also adopted a small number of words from the Breton language (e.g. pihangne 'spider crab', from Breton bihan 'small'; quédaine 'fast', from Breton gaden 'hare'), although the influence on today's language has overwhelmingly been from French and, increasingly, English. entered the language through the employment of Jèrriais-speaking servants in the houses of bourgeois English-speaking immigrants. However, care needs to be taken in attempting to identify anglicisms because some words, such as mogue (mug) and canne (can), which are often assumed to have been borrowed from English, were in fact Norman words exported to England in the wake of the Norman Conquest; and words such as fliotchet (flock) and ridgi (rig) are Norman cognates of English words. More recently, words such as boutchi (to book), partchi (to park) and tyeur (tyre) have been absorbed into the language, although current initiatives in creating neologisms for technological and social innovations prefer to avoid wholesale borrowing where possible. Among recent coinings are words such as textéthie for texting, maître-pêtre for webmaster (literally master-spider) and mégabouochie for megabyte. The phonological influence of Norse is debated, although the aspirated "h" may be due to Norse influence. However the palatalisation of /k/ before front vowel produced different results in the Norman dialect that developed into Jèrriais than in French. (Many developments are similar to those in Italian, cf. cento-hundred and faccia-face). The fricative devoices to assimilate with a neighbouring unvoiced consonant in words such as paqu'thie (packing) or malaûc'theux (disgusting). The fricative developed from /r/ + front vowel, but evidently after the 16th century as this feature is unknown in the language of Sark (colonised by Jersey families). Although the voiced dental fricative is standard in the literary language, it is not found in the eastern dialects. This gravestone of George Francis Le Feuvre ("George d'la Forge"), at St. Ouen Parish Church, describes him as Auteur en langue Jèrriaîthe (Jèrriais author). The particular St. Ouennais form of Jèrriaise with final dental fricative is represented. Some older speakers in St. Ouen use a dental fricative in positions where other dialects show a /z/. This may be represented in the orthography of particular writers. Length is phonemic in Jèrriais. Long vowels are usually indicated in writing by a circumflex accent. A noun ending in a vowel lengthens the final vowel to indicate the plural (shown in writing by adding an s). Gemination occurs regularly in verb tenses, indicated by a consonant-apostrophe-consonant trigraph, for example: ou pâl'la (she will speak); jé c'mench'chons (we will begin); i' donn'nait (he would give). Gerunds will also regularly contain geminate consonants, for example: faîs'sie (doing, making); chant'tie (singing); tith'thie (shooting); brîng'gie (sweeping); gângn'nie (winning). ↑ Hammarström, Harald; Forkel, Robert; Haspelmath, Martin; Bank, Sebastian, eds. (2016). "Jerriais". Glottolog 2.7. Jena: Max Planck Institute for the Science of Human History. ↑ "Archived copy". Archived from the original on May 11, 2011. Retrieved May 31, 2011. ↑ Fallu, Jean-Marie. "La Gaspésie jersiaise" (PDF). Magazine Gaspésie, Été 2012, no 174. Musée de la Gaspésie. Retrieved 22 July 2012. Les Chroniques du Don Balleine/Les Nouvelles Chroniques du Don Balleine (magazine). Jersey 1979 – current. Wikimedia Commons has media related to Jèrriais.